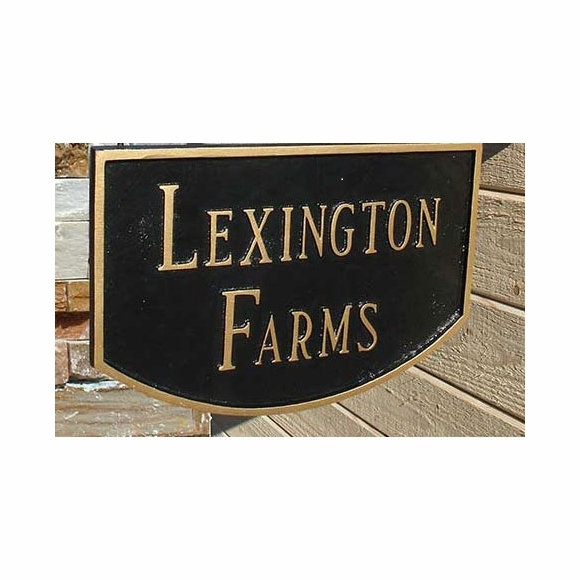 Personalized Two Side Hanging Sign - - large hanging farm name plaque, ranch name sign, estate name sign, or business, school, residential entry sign. Two lines of text can be used for any type of address or message you want to display. Line 1 holds nine characters. Line 2 holds five characters. Same text on both sides. Hang from a tree, an existing post, or bracket. Has two loops at top for hanging (not shown in photo). Color: black with gold letters and border as shown. Large 2 sided hanging plaque with text on front and back. I decided to order this sign despite some concerns, and I am very glad I did. The "crispness" of the casting is very good, the pebbled aluminum background gives a nice texture, the sign is very heavy. Also, I only needed one of the two lines available and so thought the vertical spacing might be off (my text on top and a big open space below). Instead, the sign maker centered my one line vertically, giving it a great appearance.